Hertz is a car rental service that provides customers with regular and luxury cars for rental across the world. The publicly traded company (NYSE: HTZ) operates as The Hertz Corporation, a subsidiary of Hertz Global Holdings Inc, though it's known simply by the brand Hertz to customers. Cars can be hired on location at a Hertz building, by phone or through their app and website at Hertz.com. Details: Get $25 Cash Back for Online Bookings of $250 or more! Not valid with CDP codes. The site is particularly beneficial because allows you to easily redeem special offer and deals to get money off your rental. This is done by using Hertz coupons, a list of which we keep up to date here at Coupofy. So whenever you're thinking of hiring a vehicle, check back here to ensure you get the best possible discount. The company traces its roots way back in 1918 in Chicago, with a small fleet of Model T Ford cars. It wasn't known as Hertz until 1923 when founder Walter L. Jacobs sold the business to John D. Hertz. Her merged his new acquisition with his Yellow Truck and Coach Manufacturing Company. This was then later sold to General Motors, but Hertz purchased it back in 1953 and took the company public. After several more corporate maneuverings the company fell in to ownership of Ford in the 80s. In 2005 Hertz was then made public again and a group of private equity firms took majority control. Today the company has over 29,000 employees all over the world, with John P Tague servicing as CEO. Hertz caters to individuals and businesses who wish to hire vehicles for short periods of time. Their fleets include Cars, Vans, and Luxury & Speciality vehicles, with pricing representing the size and value of the vehicle. There is a huge selection of individual makes and models, which vary from country to country. These vary from something as exciting as a Porsche 911 to a typical family road vehicle. As soon as you arrive at the site there is an efficient booking platform that allows you to choose the location where you want to pick up the vehicle, the date of pick-up and return, and the type of vehicle you wish to rent. There is also a space to enter one of our Hertz coupon codes, to get you a nice discount. You can also visit their special offers page for more great deals. If you regularly need to rent vehicles you may want to consider signing up to their Loyalty Programme that helps you save money in the long term. If you 're new to rental there is tonnes of information and guides on the site. The process is fairly simple. You book where you're going to pick-up the vehicle and when finished you return it to the agreed upon location. Hertz requires a common credit card to make a booking, such as Visa, American Express, Mastercard, or Discover. Your card is only charged once you return the vehicle and at this point you may choose to pay in cash instead. 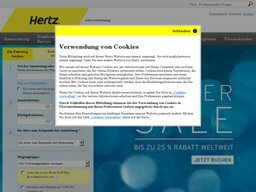 To redeem a Hertz online coupon code all you have to do is copy the code over from Coupofy and enter it in to the box when arranging the booking. If you have a Hertz printable coupon this must be presented to one of their staff at pick-up or drop-off. When hiring a vehicle you are required to pick it up from one of their many locations across the world. This might be a Hertz depot, airport, or city spot. At the time of booking you will also agree a location where you will return the vehicle and finalize payment. If you have used a Hertz rate code this will be at a discounted rate. You are free to cancel a booking through Hertz at any time before the date of pick-up. However you will be charged a fee if you cancel within 7 days of the date. If you return a vehicle early you will still have to pay the full price as if you used it for the full duration. If you believe the vehicle was faulty or there was some other disruption to the service you are entitled to make a claim. You will only be protected in an accident if you take out an optional Hertz protection plan. You may however be protected by your own insurance plan, but you should check with the provider first. The customer is responsible for all loss and damage to the vehicle sustained during the rental period.